It's also a play full of characters of a certain age. The aunts may be sweet old ladies who wear lace but also like to add a few extra ingredients to their wine. If you don't know what that is, well you're in for a treat. There's also the neighbors, gentlemen visitors, the local cops walking the beat, and a very odd nephew or two. Douma's role underwent a gender switch so she could be Lieutenant Rooney. But other than sensible accommodations like that, this production remains faithful to the original script. “The director Marianne Savall leans into the style of the 1930s period. Sharp comic timing. Wonderful ensemble acting,” said Douma. While the play is best known these days for high school productions and the Cary Grant movie, it’s rare to see it done as professional theater, she added. “And it is a treat with this cast" like longtime Seattle and Taproot favorites like Kim Morris and Pam Nolte in the roles of the aunts. 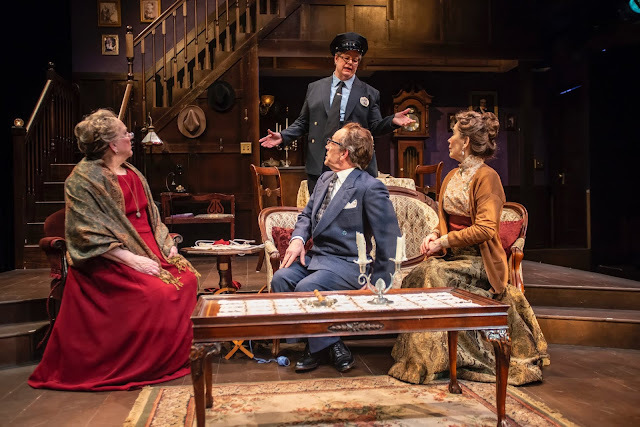 Kim Morris, Gretchen Douma, Bill Johns, and Pam Nolte in "Arsenic and Old Lace" at Taproot Theatre. Photo by Erik Stuhaug. For Douma, character roles have shaped her career. “My college degree is in English but I had a second major in theater. I always played much older characters when I was in college. So when I got out of school, I had to wait a while to get old enough to play those kinds of parts again. In the world of ‘real theater,’ no one casts a 20-year-old in those older roles,” she recalled. Moving to Seattle in 2000s, she spent some time on the administrative side of the arts before plunging back into acting. Local audiences will have seen her in key character roles at Annex, ArtsWest, Live Girls!, Parley Productions, Second Story Rep, and 14/48, to name just a few. Douma traveled to New York with Forward Flux to recreate her parts in the “Grief Dialogues” for the Dramatists Guild’s New Works Showcase. Recently Douma began experimenting with writing plays, creating two full length works with the kind of roles and stories that she found intriguing. For “Baby Talk” and “Ashes, Ashes, We All Fall Down” she worked with Parley founder Rebecca Collingsworth-Tourino. Douma also tried a stand-up comedy class. “I believe in scaring myself,” she said about the latter. Through March 3, you can catch her in “Arsenic and Old Lace” at Taproot, adding to the comedic confusion, and then look for her on a stage near you, probably adding a little bit of drama to the third act. Update: Due to snow earlier in February, Taproot has added a 2 p.m. Sunday matinee to extend the run until March 3! Many of the earlier dates are sold out so check this last weekend for availability and book your tickets soon.